Do you need a battleship that flawlessly deals with the defence systems on planets? Do you need a ship with a significant structure which will not fail you in combat? The Battlecruiser is the ship for you. It is armed with the latest defence lasers, photon torpedoes and ion weapons. 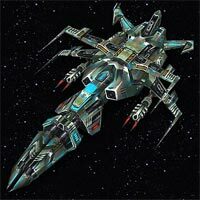 The main armament is a powerful plasma weapon, which can destroy smaller ships with one single blast. It's equipped with thick titanium armor and amazingly resistant shields, making it a real survivor on the battlefield and a difficult target for the enemy ships. But despite all these good aspects there is a really bad one- ultra weight. The impulse engines are not powerful enough for the battlecruiser and that's why four ultraspeed engines are installed. With them the ship receives a good maneuver ability and velocity. Cargo: 1500Attack: 6000Ship hull: 60000Speed: 10000Gas consumption: 500 Cost: 40000 Metal, 20000 Crystals Weapon: Plasma;Armor: 15% Normal; Improvements in Factory: 8% per level.